Kristen Malfara, Morgan's mom, Executive Director and founder of The M.O.R.G.A.N. Project describes the fundraiser's activities and the local benefit it provides. It's Turtle Splash time of year!! We are adding prizes every day right up until the day of the splash, and we award lots of valuable prize packages every year to our adoptive parents of our little plastic turtles. Be sure to check back often as we update our prize donations. What is a Turtle Splash? The idea is quite simple. People everywhere will adopt our cute little plastic numbered turtles. Our adopted rubber numbered turtles will "splash" their way to the finish line - now held at Rotary Park at Suntree and broadcasting the splash LIVE on Facebook at NOON. The adoptive "parents" of the winning and placing turtles win valuable prizes. The M.O.R.G.A.N. Project gains community exposure, raises lots of money, helps children with special needs, and everyone has FUN in the process! Turtle Splash event is at NOON on Saturday, May 4, 2019. Join us for FUN pre-event activities at the main pavilion beginning at 11:00 am. What is The M.O.R.G.A.N. Project? We are a 501(C)(3) nonprofit charity with Quality of Life support programs for children and young adults with special needs that have been designed around one very simple value: to enhance their quality of life. We provide the tools for a therapeutic and fun experience to children with physical and developmental needs. 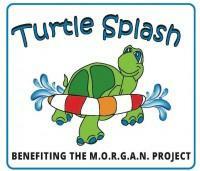 Visit us online at www.TheMorganProject.org. Morgan’s Place provides a safe environment for parents to bring their children and young adults with special health care needs and disabilities for hands-on therapeutic, creative, and fun activity and play in our one-of-a-kind Sensorium - a wireless multi-sensory environment for children with sensory processing disorders and/or physical disabilities engineered to stimulate the sensory pathways of taste, touch, sight, smell, sound and movement without the need for intellectual reasoning . This year the Turtle Splash is joining the Eau Gallie Arts District annual Founders Day event, which takes place February 6th, 2016 from noon to dusk. This is a family fun day event, with food vendors, live music, fish fry, beer, entertainment and much more! Once again we will be providing our incredibly fun Children's Activity Area with lots of games, inflatables, and activities as we have done in the past.